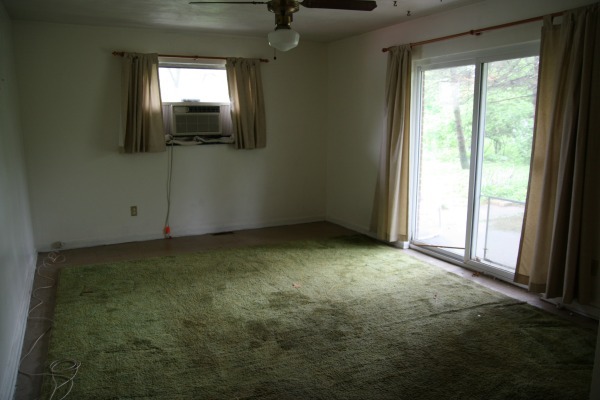 There was an A/C unit in the window and an ominous ceiling fan. We thought the laundry closet was cumbersome. The dryer vented directly into the attic! Ugly tile and a remnant of green shag carpet completed the mess. We did like that this room served as a pause when entering from the backyard through the sliders (on the left) and from the garage via the man door (on the right). Out of necessity we assigned this room multiple purposes: mudroom, dining room, craft room, game room and laundry room. Knowing the room would receive abuse on a daily basis, we opted for durable, dirt-colored tile on the floor and a forgiving tongue-and-groove wainscoting on the walls. (The tongue and groove is a repeated element also seen on the vaulted ceiling, planked TV wall and kitchen desk backsplash.) We were in need of closed storage for seasonal outerwear, reusable shopping bags, a broom, crafting supplies and a small collection of home accessories. We added a pair of freestanding wardrobes to serve as closets. One is customized with hanging rods at different heights (for outerwear) while the other is full of deep shelving (for crafting supplies and home accessories) and even a hidden litter box! In an effort to optimize wasted space under the window, I commissioned a local woodworker to create a custom wood bench out of Douglas fir. 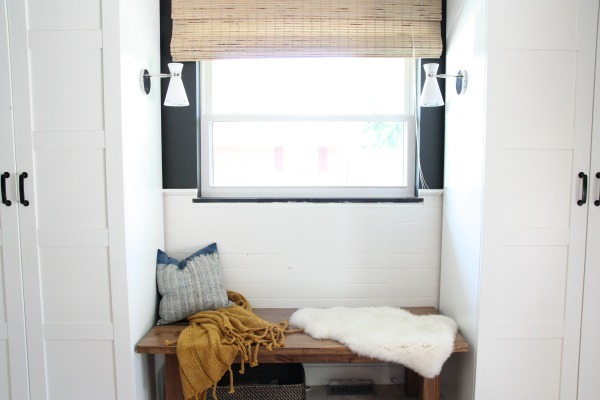 We hung sconces above the bench on side panels of each wardrobe to create a cozy nook without actually changing the structure of the room. It’s a great place to read, play a game of Uno or watch the kids get on / off the bus. The bench is surprisingly large! A long, farmhouse-like table is perfect for dining, crafting, sewing or enjoying family game night. I chose a lighter wood tone to avoid overpowering the space. A mix of knockoff tulip and wishbone chairs surround the table for a laid-back vibe. I had the tulip chair seat cushions covered in a vinyl leather-lookalike. They are so kid-friendly! 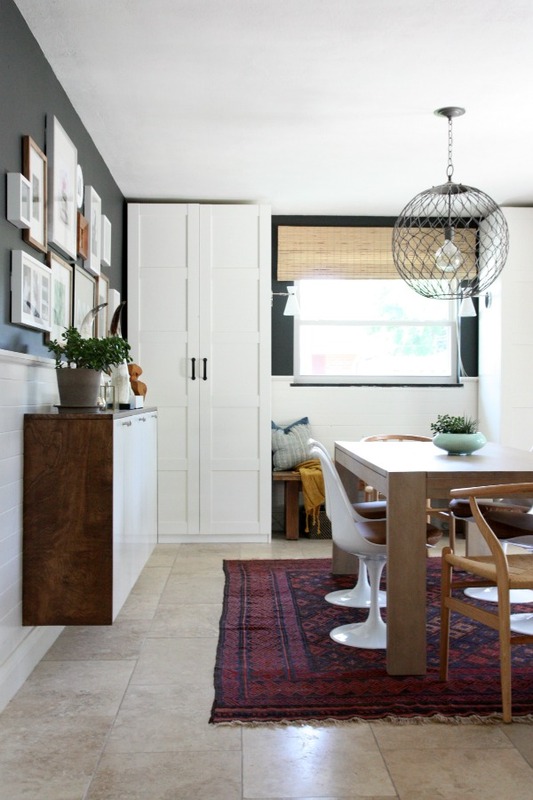 The iron pendant is industrial and beautiful all at once – which is fitting for a mudroom-slash-dining-room. We DIY’d a fauxdenza to house board games and incoming mail. The sleek profile and floating installation free up precious floor space. Cleaning underneath it is a breeze. 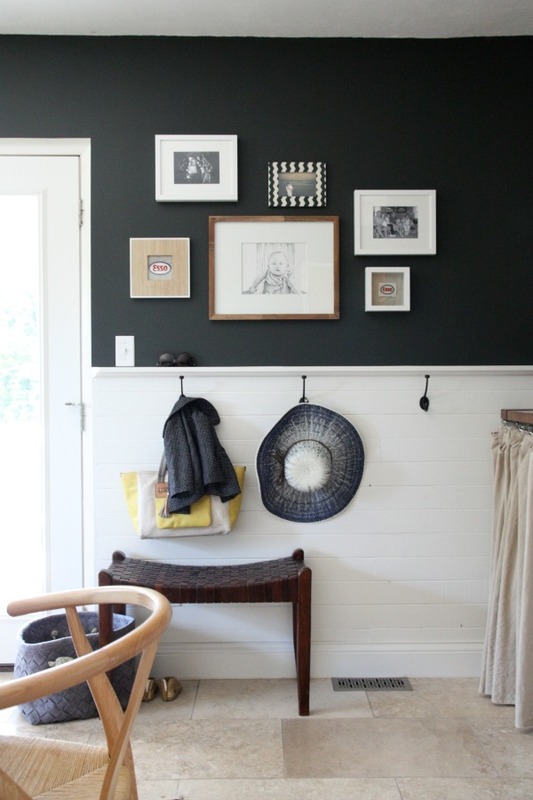 I painted the walls THREE TIMES before falling hard for the velvety black. It’s a great contrast to the slick surfaces and oodles of white. A gallery wall of family photos and art dress up the space so when we eat in here it doesn’t feel like we’re eating in a mudroom. We had the original sliders replaced with french doors. This room is our main entrance / exit on a daily basis and, for us, the doors are easier to open and close. Not to mention, they look better. A small bench just inside the door gives the kids a place to put on / remove their shoes. A felt basket and a trio of hooks corral shoes, bags, jackets, backpacks and hats. We try to keep only the items we’re currently wearing or using out in the open. The rest is stashed in a wardrobe. 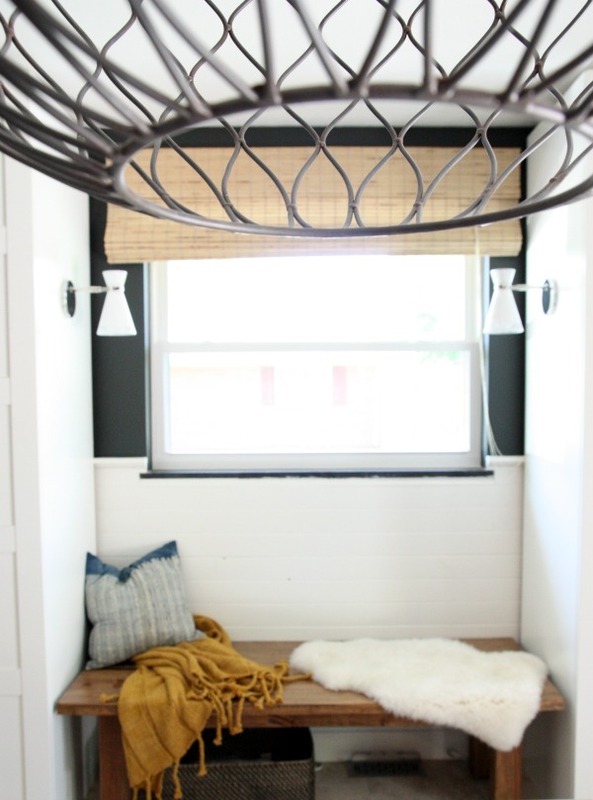 We nixed the laundry closet in favor of a laundry nook. (And the dryer now vents to the outside.) Discovering a recessed dryer vent box at Home Depot was like winning the lottery. 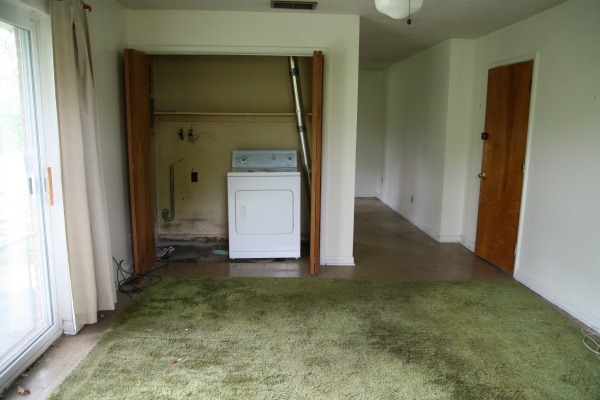 It allows the dryer to hug the back wall. We built the wood countertop using boards we found in the attic during renovations. A small “lid” opens to reveal the washer controls and detergent dispenser. In a perfect world, I would have a dryer with a flat top and controls near the front so the countertop could extend all the way to the back wall. But I have never lived in a perfect world so until my current dryer konks out, I’m stuck with a raised control panel on the back of the dryer and, consequently, a tiered, shallow shelf above the countertop. 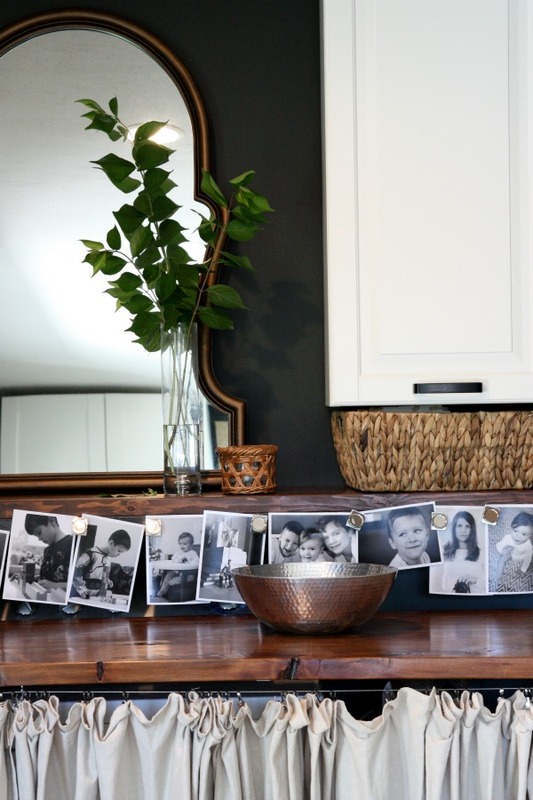 For fun, we added a metal strip along the shelf to display family photos held in place by magnets. 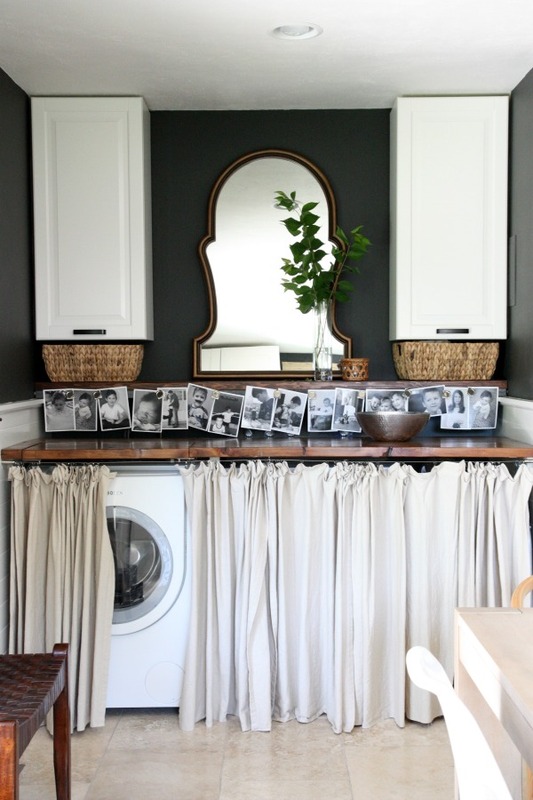 Fabric panels hang from curtain wire to conceal the washer and dryer while still allowing easy access. I also keep a rolling cart and small ironing board hidden behind the curtains. Two upper cabinets hold laundry essentials, instruction manuals and lightbulbs. A leaning mirror bounces light around the dark corner. The idea behind the laundry nook was that it could function as a serving area / bar when we entertain. I’d love for it to pull double duty as a dry bar someday. And who said doing laundry wasn’t fun?! Admittedly, we eat most of our meals at the kitchen island but it’s nice having a designated dining table for special occasions and entertaining – even if, technically, it is in a mudroom. I never have liked formal dining rooms that are only used once or twice a year anyway. The small laundry nook forces me to fold and put away clean laundry as soon as it’s dry. That might seem like a disadvantage but it’s super effective and keeps me honest. This (unusual) setup totally works for our family and we’re happy we aren’t wasting money on unused space. It’s such a hardworking room! 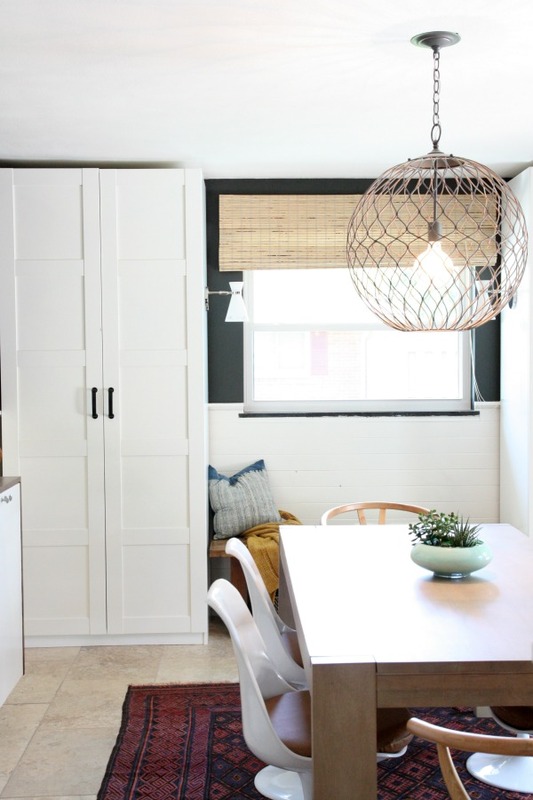 You can access this mudroom / dining room tour via the “See My House” link in the side bar along with a general house tour and tours of individual rooms. Thanks for reading! Amazing transformation from before to after!! Love the style but most of all I love how it is the epitome of a multi-functional room!! This room is my inspiration for so many rooms we have yet to face. I can’t say, “Well done!” enough. Seriously. THANK YOU for doing the room by room series. 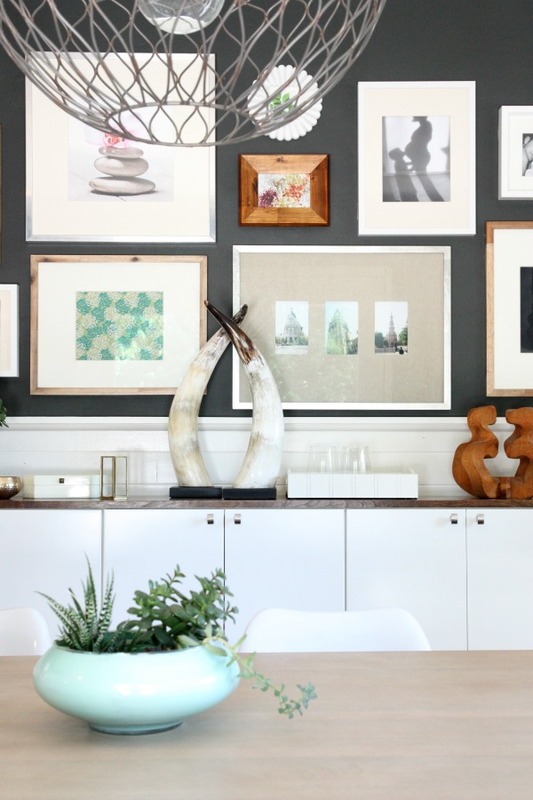 I love pouring over all of your color, accessories, sources and paint colors. Love your style!! Did you “hack” the Pax wardrobes in some way, or did the fronts of the doors come like that? LOVE LOVE LOVE this room! Thanks for sharing! The doors are the Bergsbo design – off the shelf from Ikea! Does the Benjamin Moore White Dove paint match the white in the Ikea Bergsbo Doors? We’re trying to put trim around our pax units to make them look more built in, but we’re having trouble getting the right shade of white to match the doors. I love seeing this summary post after having followed along the whole process on your site. The After shots are so amazing. Side note: I’m spending a year traveling abroad and sitting with a cup of coffee and reading your blog helps with the homesickness. Can’t wait to see how the guest bath progresses! Are you saying this blog feels like home to you?! If so, that’s the best comment I’ve ever received. Enjoy your time abroad! This is such a great space. Multi-functional rooms can be so hard to pull together in a cohesive way, but this room really looks great. This room and the process of getting it here is super inspiring for me. I love that you guys are living in a fairly small home as a family, and living well. I’m expecting my first baby and all my friends seem to be moving on to their next giant home! You make me feel OK about being happy with my small home. So, thanks! Congrats on your lil’ one! I’ve totally watched friends and family members “move on up” and thought, “Am I missing something?” I don’t want to be tied to a (big) mortgage for that long. LOVE this room! can’t believe how much use you can get out of such a teeny tiny space! I love this room so much! I have looked at Ace several times and can not find the color besalt….or a brand of Ace paint. They carry Clark and Kensington or Valspar. Any idea how I could get this paint color? Besalt is on the Ace paint color deck (even though there is no Ace paint). The color number is D36-7. I had it mixed in Clark + Kensington primer + paint in one. Hope that helps! I love the paint color against such a bright white. It balances everything perfectly! The pendant light is amazing! I never would have even bought the house from all you have shown as the reno seems so much, but you did it and did it wonderfully!! I’m glad you’re enjoying the “tour” even though you’re a longtime reader! What a fantastic transformation! I’ve said before that I’d love to rehab a ranch bungalow when I finally return to Texas, and your blog provides great inspiration. As for having a mudroom/laundry room/dining area/games area: here in Europe most houses are small so rooms are multipurpose. Its more common to have one’s washer in the kitchen and not have a dryer because space is at a premium. Your decor inspires so much of what I do in my own home. I find myself lightening up, going more graphic, and paring down, because I want it like THAT. I keep hoping that you’ll do some sort of meet-up in the area (thrifting or some such?!) because I feel lucky to have a blogger with such a bomb sense of style in my general region. I also wanted to ask for what the original owner used the everything room. A den? I always thought of previous owner using it as a “cooling den.” Ha! The house didn’t have central air when we bought it (we added a heat pump) and that room was the only one with a window A/C unit + ceiling fan. It was probably the coolest room in the house during summer. When we bought a similar home in the same neighborhood, the real estate listing described it as the “family room”. It’s always been our TV room. We had lots of trees when we first moved in, which kept things cool, even with only the window unit in the same location. When we replaced the furnace 10 years later, we added central A/C. I really love this space. Your design aesthetic really shines through in this room. I know you have said it before, but what is the ceiling height in this room? I am in the early stages of looking for my next house and have come across a few cottages that have much lower ceilings than my current 12′ whoppers. I am finding it it difficult to get past the ceilings, but remembered this room and how much I love it. The ceiling in the mudroom is the original 8′. I think the tall wardrobes and wall cabinets (hugging the ceiling) actually make it feel taller than it is. I love your decorating style Dana! It’s modern and classic at the same time. 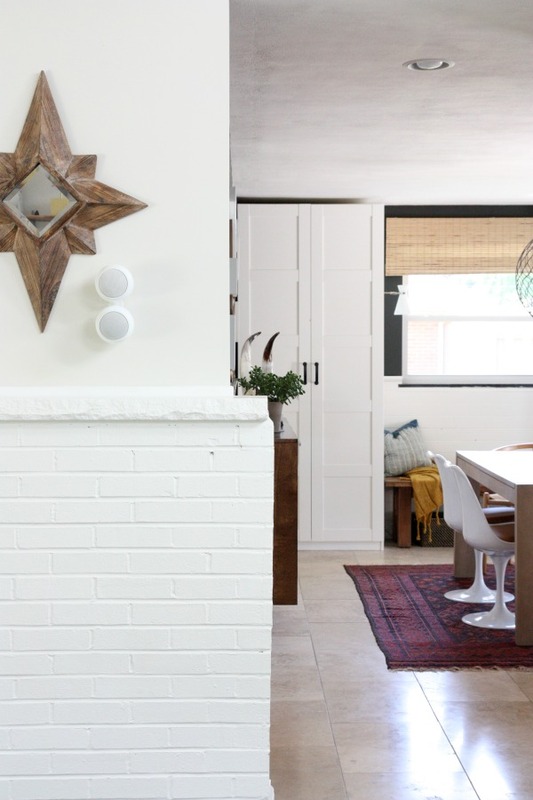 I’ve started gravitating toward a similar style as well and your home is definitely an inspiration! I found you through Young, House, Love, when Sherry talked about your chairs. I love the mix of high and low and that you evolve over time, which is how decorating should be done! Keep tweaking and I’ll be following along! Our dining room is also our mud room, but it happened over time & by necessity, not so much by design. I’ve been following your blog for a while & have been Inspired to take on the task of truly transforming it into a more intentionally multifunctional space! Dana – What size is your table? Is it expandable? And how much clearance do you recommend between dining tables and dining room walls? The table is 3′ x 6′. It doesn’t extend. We have at least 40″ clearance around the table (it’s more on some sides) to allow for chairs and traffic…and that’s 40″ from the edge of the table to the closest thing – not necessarily the wall. It’s plenty of room. Not sure I would want any less. Ok, so I must have died and went to home tour heaven. So glad I found your blog via IG. Love every inch of this multi-purpose space. We just bought a fixer upper as well and will be sharing pics as we go along, slowly for sure cause there’s so much to do! What an awesome transformation! Love your “everything” room…looks super functional for the whole family! The only thing you didn’t mention a source for is that fantastic sunhat you have hanging on the hook. Love the room, but I might just need that hat. Love the Pax wardrobes. I’m on IKEA’s website looking for the exact set up. It appears those doors are available in the exact look, but with glass panels instead. Do yours have glass panels? They seem to be “wood” in your photos. I don’t want glass :( Any ideas? 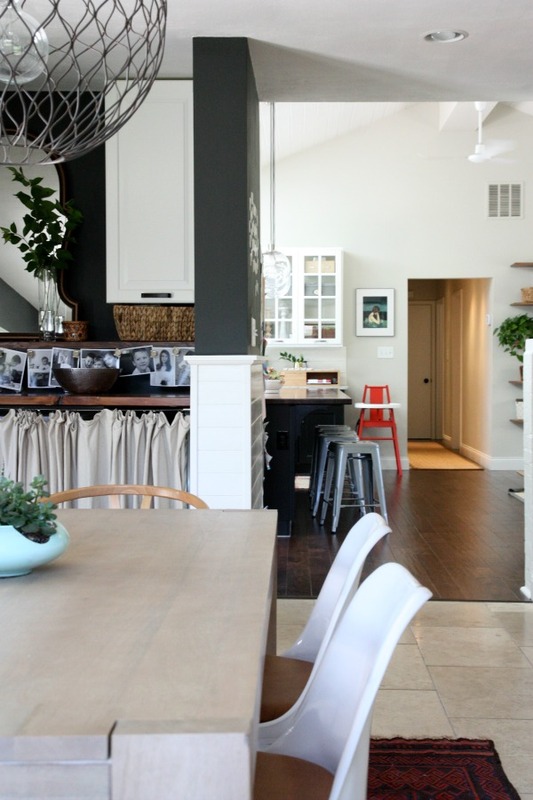 So inspired by your house! Absolutely love all the vintage rugs you use throughout your house. Any recommendation on a particular vendor from etsy you have had a good experience purchasing from? I LOVE everything about your house! It’s funny how I buy and collect random things hoping that it would all look good in the house. But your house looks very well thought out, decorative elements match through the house and yet still very live-able and child friendly. Thank you for including all of the sources, I will have to widen my shopping to include these new stores for a new perspective on my house. You should know that I make a lot of returns. I have no problem taking something back to the store if it doesn’t work. That’s my secret. Ha! This color is amazing, you are seriously so talented! Im trying to decide where i can add this color in my house, think it would match creamier ivory colored trim or would I need to paint it white? Seriously, it goes with anything! It would look great next to either. 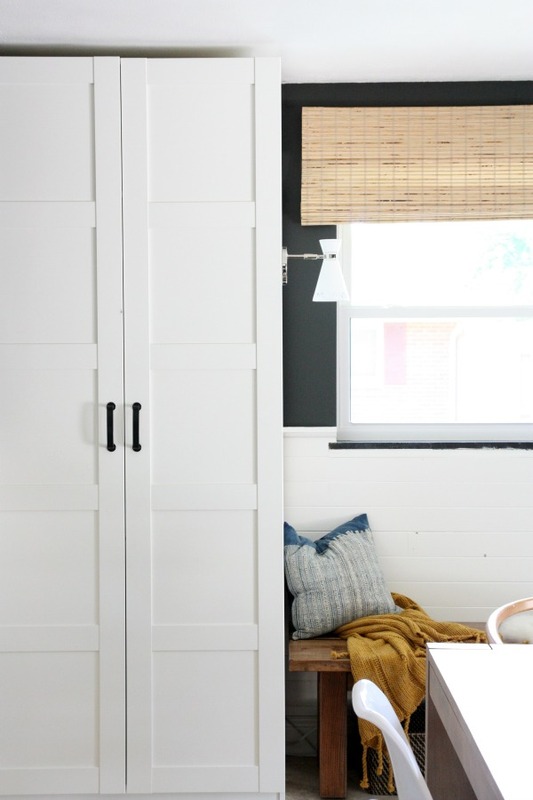 Our trim is Benjamin Moore white dove which is a warmer white but the contrasting black makes it appear even whiter. 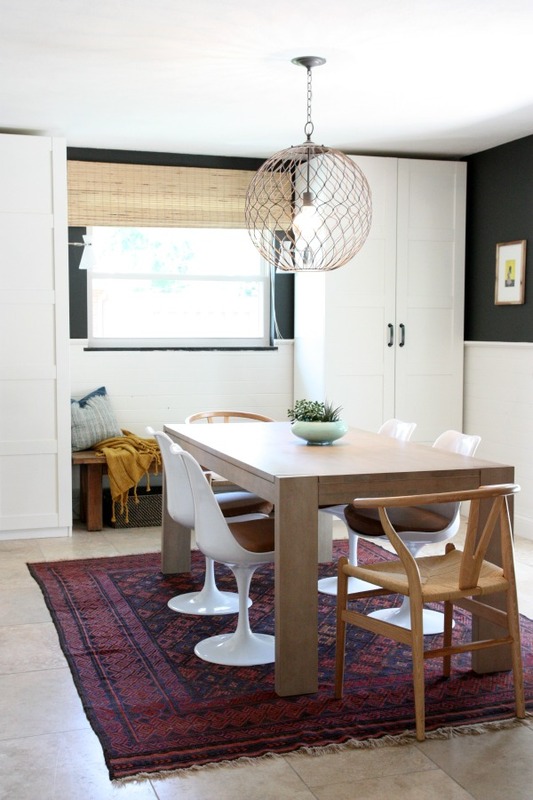 Love the Kilim rug. What size kilim rug did you get? Looking to get a Kilim rug for my dining table and your dining table looks about the same size as mine. It’s a non-standard size which is what I needed for the space. It’s roughly 6 1/2′ x 9′. Can you tell me how tall your vaulted ceiling is? What are the dimensions of your dining room, please? Thanks. 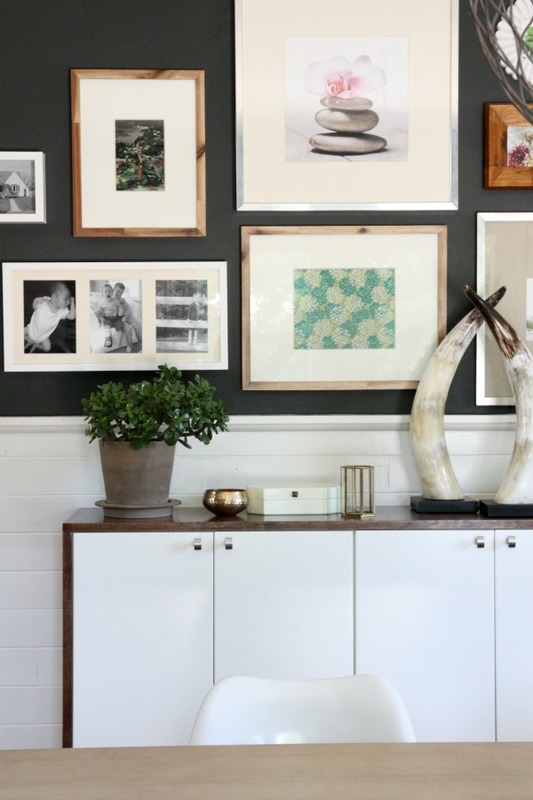 The dark wall color is such a perfect compliment to all the white and natural wood tones. The layout of this room is great—so functional and FUN! I love all the pictures on the walls. Your house is a dream! Hi there! I know I am posting late but I just ran across your blog. I love your kitchen! I do have some questions though. I am trying to find out the specific name of your rug in front of your sink as that seller on etsy has a ton of rugs. Also, what color did you paint your ikea stool? Thanks so much!